The perfect ski to get the kids hooked on skiing. A first time ski for children. Cap ski construction, Bear Claw base, and/or plastic bindings and poles. 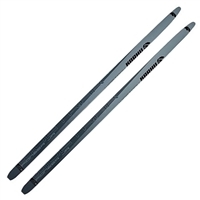 Karhu Eagle Optigrip - Jr.
No-wax ski that gives good grip and glide and works well in near freezing conditions. Universal junior skis offering stability and reliability for cross country skiing beginners. Equipped with multi-grip base.